I read this article and found it very interesting, thought it might be something for you. 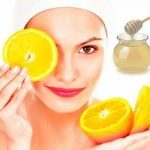 The article is called Orange & Honey Face Mask For Normal & Oily Skin and is located at https://homemademasks.net/homemade-face-mask/honey/homemade-face-mask-for-normal-skin/. This mask stimulates blood circulation and invigorates the skin tissue. It is not only recommended for normal skin but for normal with oily tendency as well. The properties contained by honey will nourish your skin while offering an ideal balance when combined with the medium level of acidity from the orange juice. Mix these together and apply them on your cleansed face and neck. Leave it to work for 30 minutes and then remove it with warm water. Rinse your face with some cold water as well for refreshing completely your skin. For great results it should be applied once a week.